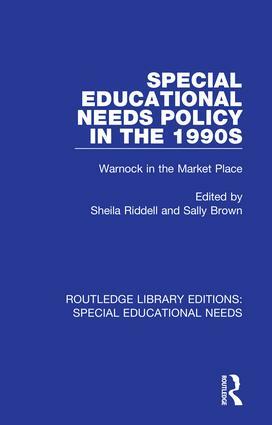 This book, first published in 1994, explores the impact which changes in thinking and policy at national and local level have had upon the educational experiences of children and young people with special needs in England, Scotland and Wales. Two major factors are discussed. Firstly, there is the thinking of the late 1970s which emerges in documents such as the Warnock report and the legislation which followed it. Secondly, the authors examine the educational policy and legislation of the 1980s and early 1990s which aimed to encourage the operation of market forces. Through the various articles in this collection, the contributors discuss both the common themes and the tensions created by these changes, and assess the effect these have had on special needs education in practice.